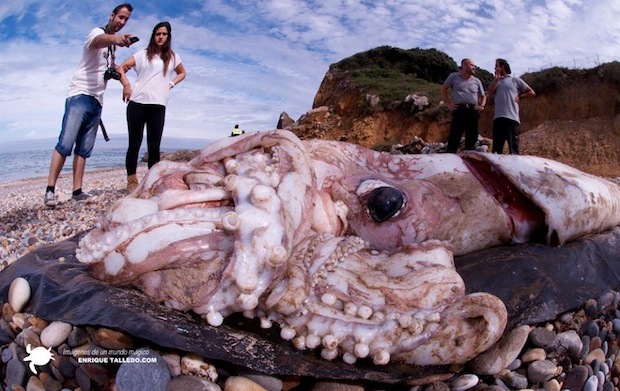 A giant squid (Architeuthis dux) washed ashore near Cantabria on the northern coast of Spain this week. 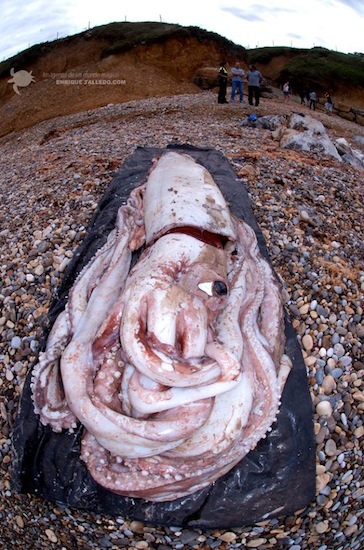 Marine creatures wash ashore all the time. Dolphins, whales, seals, jellyfish and starfish, are found on beaches around the world, often in alarming numbers. But the great Architeuthis dux is one of the rarest of all sightings, both in and out of the water. Little is known about them, and what is known applies mostly to what can be discovered from their corpses – even less is known about them while they are alive. A study in obscure clues and educated conjecture. They grow long, live deep, and feed large. They are creatures of the superlative. While they aren’t quite the largest invertebrate (that honor belongs to Mesonychoteuthis hamiltoni, the colossal squid), they aren’t much smaller. Their long tentacles, lined with the suckers that make them so fearsome to us, are actually more frightening than I had realized. Each sucker is lined with hard, sharp chitin – claws with which the prey is drawn inextricably towards the inner beak. Their eyes are the largest in the world (except for perhaps those of their large cousin, the colossal). They have formed the stuff of human fantasy for centuries, mythical stand-ins for the dangers of the unknown, kraken-points on a map to indicate where rules of the known world becomes treacherous and can pull the unwary sailor into the inky depths. And the giant squid is one of the main characters in one of the strangest books I’ve read all year, China Miéville’s Kraken. There have been a few live sightings – elusive, tantalizing and intriguing. The posthumous fate of this particular squid is undecided. It might go to a museum, it might be dissected. But for a moment, at least, it succeeds in death what it undoubtedly did in life – inspire awe and induce a few shudders.